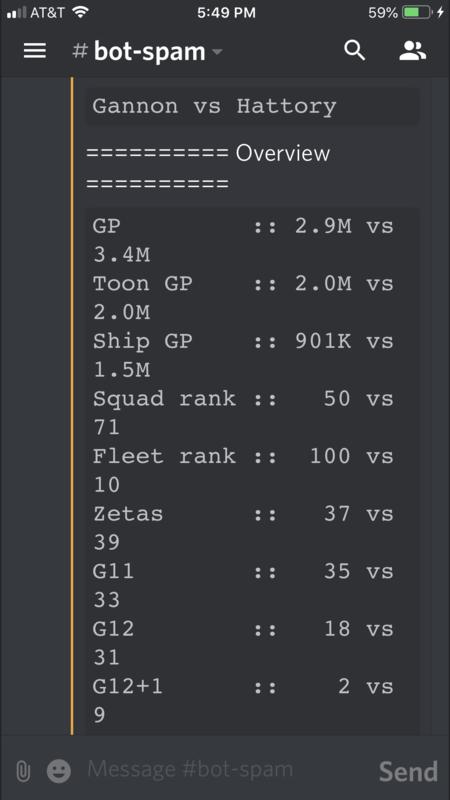 A top fleet is worth around 400k GP while a top squad is worth around 100k GP. By that measure, my opponent's fleet zone should be worth 4/5 the points of his squad zone. I don’t know if others are having the issue to but I didn’t like the current setup for GA. It didn’t effect my 1st 2 battles with opponents but this one I was close roster wise with my opponent but because his ships were better he cleared the ship zone and I lost. Even though I cleared more squads than him in character zone. Doesn’t seem fair. So, after the update "Grand Arena Matchmaking Improvements: Character-only Grand Arena matchmaking is no longer impacted by Ships GP" when will be the next improvement in Grand Arena matchmaking against Characters x Fleet? Keep the territories with 75% character power and only 25% fleet still not working. If my opponent has a Revan team he can put this wall right in front of the Fleet Territory and avoid the enemy to reach the Fleet territory. If we are going to consider both GP (Toons and Fleet) when we have fleet battles I would like to see 2 territories for Fleet and 2 territories for characters. This way if my opponent hides a week fleet behind a Revan wall, I can hide a week Toon team behind my Millennium Falcon wall. Does it in your math 170 toons 50% of the GP matchmaking? The point here is pretty simple 50%50% isn't 75%/25%, 85%/15%, 90%/10%. I really don't care how they will solve it, they should just solve it. This last GA was ALMOST fair, they split the map in a half allowing us to go directly to the Fleet zone, but the Squad zone has a lot more banner points (856 banners) from the Squad (321 banners). AGAIN we have a disadvantage. As I said before, if they don't know how to solve it, ok just don't mix Squads and Fleets, but if they do they must fix it to be a fair match. How they will do it? I don't care, they are being paid for it, if they want me to think about it, they can contact me and we'll discuss the paycheck. 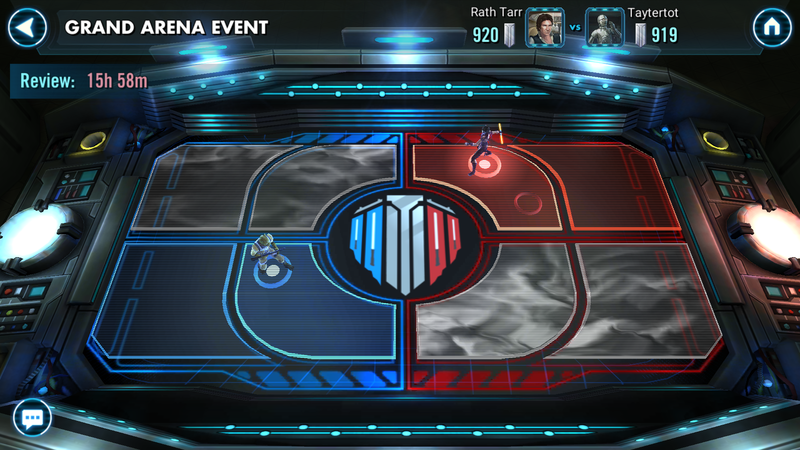 When are we going to get the win/loss record for Grand Arena? It would be nice to see it added to our profiles. And also new achievements, titles and portraits for certain amount of wins and losses. Something like a portrait/title for being undefeated would be awesome, which would be taken away after being defeated eventually. They chose the way to play the way they did because before GA there was no punishment for having higher GP. You can't use that as an excuse and base your entire post on it. Nothing in game existed before GA that made you not want to seven star everything. Nothing in game existed before GA that made you hate yourself for gearing toons. Every single way you could play before GA hit, made GA harder for you. And the thing is, GA now forces new players into a non-GP gaining focus so they get more wins. It forces older players to lower their GP or focus on getting less GP. Because GA actively punishes you for having higher numbers since it doesn't care about your roster. If GA actually cared about your roster then everything would be different and the main argument against GA would not exist. Basing on GP, and also including ship GP in squad only combat was a mistake from the start. Not to mention that crumb himself said that players shouldn't be penalized for gearing and leveling their roster. This was their main rationale for the zombie nerf. Can't like this post enough! 100% agree with everything here. so balance in the force I guess. I thought this GA was pretty well balanced, but then, I haven't really found any of them too out of whack. I have relative balance in fleet and characters, 1.05M chars to 850K fleet. I would not say I have felt overly picked on in the non-fleet events. This time, My first round opponent was... underwhelming.. and they didn't even attack me. Second round, we both cleared each other, and I lost 1310-1308... closest match ever. Just had to lose one less character! Final round, I did win, but i could only take out 3 of the 5 squads. Fortunately they seemed to make a tactical error trying to take my strongest squad out and failed in the attempt.. and it went down hill from there with 3 different failed attempts on other squads. I've been there too. So much depends on balancing defensive squads with enough offense to target their probable squads... Then once their defense is available, trying to maximum the casualties. And If I get it wrong, I probably lose. It certainly provides me with motivations to improve teams that otherwise I probably wouldn't. ie, that extra zeta on KRU or an additional gear level probably doesn't matter in any other aspect of the game, including TW, but it may make a the difference between a fail and a win in GA. I say good job on all aspects of GA! I really like the variety it has been providing., and I think its my favorite part of the game now. Things look a little different if those GP values are even or reversed. Second round, we both cleared each other, and I lost 1310-1308... closest match ever. I imagine people will now complain about vast total gp differences like this. It shouldn't really matter but ppl who have a much higher total gp have usually been playing much longer, so will have more mods and zetas. Not exactly the fairest alternative. I imagine people will now complain about vast total gp differences like this. Probably some folks who haven't heard about the matchmaking change and don't recognize that their squad GP is equal will complain. One or two who lost their GP advantage might too. It shouldn't really matter but ppl who have a much higher total gp have usually been playing much longer, so will have more mods and zetas. Not exactly the fairest alternative. Perhaps but I think the jury's still out on how much of an impact that makes. From a first glance, at my bracket, I am on the high side of total GP but that probably doesn't amount to more than a couple of months more play time in most cases. The other squad rosters seem generally comparable. I will take a more detailed look later on. I lost for a second time this month when I tied my opponent 1326-1326 the other day but his GP was greater by just a few points. Yeah, the GP tie-breaker seems daft to me. Might as well just flip a coin at that point. There has to be a better way. The game is designed to foster spending. Pay to Win, whatever you want to call it. No real skill is needed to be #1. Just watch the leaderboards, buy the latest and greatest, viola! You are in the top rankings. Next talk to your shard mates, make backroom deals, and you can stay there until the wife finds your credit card statement, and threatens divorce. Couldn't be farther from the truth...I see your point....but that is not how I am seeing it work. I have bought tons of fluff...have no Uber meta toons....(still) and I couldn't be further from #1 in any arena. And GA is a joke.... matching is made the winners are chosen by the algorithm you just there to play along with him...someone he can beat up on and walk away with premium rewards to make him Feel better....maybe! (That would be my guess). The only truth this games fosters spending but they still don't care and it don't matter. ImO they don't care! In looking at the new reward layout, I noticed zero omegas and zetas for 8th place in tournaments 1 and 3. That part really surprises me. It has usually been the case that the difference between 1st and Last has not been huge in any mode, but that seems like a departure. You did not do that for the ship omegas. While I am not a collector, I get that some are and TB certainly fueled collection for a long time. They (I) can't go back and reduce all my useless toons to level 1 or take off their mats. So the matching hurts older players. I have a guy in my group that has Drevan, jkr, traya, etc and his clones, OG Lando, etc are all level 1. Hell, even his clone wars Chewie is not even fully leveled up. I get power creep comes in so you can make money, but in other game modes it doesn't hurt you. You just get the next greatest thing or you don't. It is fixable, fair and understandable. However, I can't "fix" my roster to fit your new game mode into the playing experience. I just think it is disrespectful, at the minimum, to people that have been playing the game since the beginning. Who did you calculate the matchmaking?? Only on GP? Is it normal to have each time some adverse with all best character of the moment as I don't have them. I never have chance to win. Only one chance to not be the last... Please consider that dark traya or c3po or Chewbacca, etc.... Are not the same as very old character we have use in the beginning of swgoh!!! 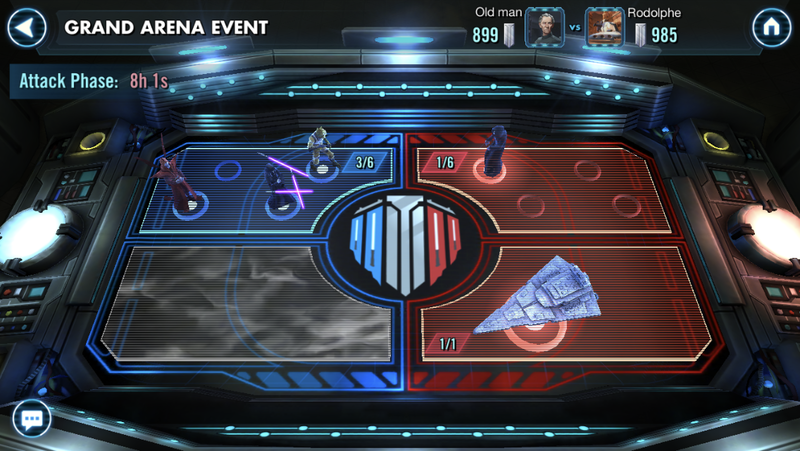 And now... We will have all cash player with datk revan... Pfff this game is not going to be fun!!! And I play since the first day.... And a have give some money to help the game developers.... But now I feel very bad. New players have advantages. They paid as old player but only for the best characters. Take back all my lvl 85 jawas team and other useless toons and downgrade my global PG, perhaps I will have chance to play with fairplay!! Just went in against carth/ordo in GA, and Ordo fired well over 10 times in a row against me. Whats the deal with that?? I have 4 zetas total. My GA opponent has 16 on his starting line defense. Super fun. It is the nature of the beast. Some focus on specific toons others seem to collect and even out things like myself. During the last GA my first opponent starting 4 squads of 5 on defense were all G12 squads. CLS, JKR, NS, and Traya. I have a total of 8 G12 toons in my inventory but our GP was fairly matched. FTR I did not win that match up and to be honest did not even try when what I had available. Today is the 3rd time this month I lost again due to a tie. My opponent has exactly 133 more GP then me. Gotta love this game. Yes we both finished tied 1431-1431.